Home Costs > How Much Does Acrylic Paint Cost? How Much Does Acrylic Paint Cost? Acrylic paint is known for its high-quality finish and fast drying attributes. Acrylic paint has an ability to bond to surfaces of all kinds when mixed with additives. The paint can come in a thicker form, allowing the artist to have an oil painting effect, or a thinner form, which appears like that of a watercolor. The cost of acrylic paint will depend on the quantity, the amount of paint in a set, the brand, colors and retailer you purchase it from. Two to eight-ounce tubes will cost anywhere from $1 to $6. At Michael’s Craft Stores, for example, a smaller two-ounce tube can retail for about $1. At Walmart, eight-ounce bottles retail for $4 to $14. A set of 6 to 24 colors of paint, which may contain 12ml to 90ml of paint per tube in the set, will cost $10 to $70. This highly popular 48-piece set on Amazon.com, for instance, retails for about $35. By the gallon, it can cost about $25 to $45. 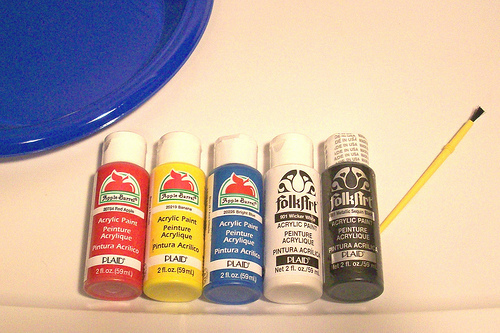 Acrylic paints included in a set will come in separate tubes with varying colors. A set may also include pumps and paint brushes. On the market, there will commonly be two grades: artist and student quality. The artist quality, often referred to as professional quality, will have a high concentration of finely ground pigment and will have very high permanence ratings. Student-grade will often be cheaper, and it will have unnecessary filler which can weaken the color; there will also be less of a selection in terms of color. Acrylic paint can come in many different colors, but the most popular include white, yellow, orange, red, crimson, green, blue, purple, burnt sienna and black. The drying time of the paint will depend on factors such as the temperature, humidity, brand, color and how heavily it will be applied. It should take about 30 minutes for most projects. If the set does not include one of the colors you need, you may need to purchase a few individual tubes. Many painting accessories will be needed such as a palette ($4~), brushes ($12~) and an easel ($5~). When shopping for acrylic paint, there are a few things you will want to pay close attention to since all paint isn’t created equally. You will want to consider the quality, the color, viscosity, tube, drying time and the brand. When purchasing a paint, pay close attention to the “series” number. The higher this number is, the more expensive the paint will be. This number will refer to the pigments within the paint that can be harder to obtain. A paint with synthetic pigments can have a lower series number, while a higher number, such as six or seven, will be derived from cadmium. The ATSM rating on the jar will refer to the lightfastness standards. The higher the number, the less likely the paint will fade when exposed at night. ATSM I will be an excellent rating, while ATSM III won’t be as good and will be a lot more likely to fade over time. Heavy body acrylics can be found on the market in either a tube or jar. These paints will have a pastier-like consistency, but it will still flatten out when applied to a palette. These paints can be applied to fabrics; however, many find the paint tends to get stiff as you add layers. To make sure the paint works with fabric, it’s recommended you get a textile-based paint. Is acrylic paint toxic? As long as the paint is used for painting purposes, it isn’t considered toxic because it’s water based. Pay close attention to the label as you will find some toxic ingredients such as chromium, lead, cobalt and cadmium. If ingested, this could cause harm. Is acrylic paint waterproof? Since it is water-soluble, it will become water-resistant when its dry. You will be able to gently wash with soap and water. Can you use acrylic paint on the skin? Many acrylic paints will contain pigments which are toxic for your skin, so it’s important to use material designed for the skin only. Even if it’s deemed “non-toxic,” it doesn’t mean it will be. Can you use acrylic paint on wood? You can almost paint anything with this paint, and wood is no exception. Does acrylic paint work on glass? It will work; however, it won’t stay on permanently since glass is a non-porous surface. When painting on glass, be sure to read the instructions so you can get the right consistency. What is the advantage of acrylic paint over oil paint? You can paint on anything with acrylic paints, allowing you to start painting on just about anything. This paint offers crisp edges and is ideal for those who want to work with paintings with more details. Over the years, the paint won’t fade. Laboratory tests show that in 200 years, the colors will look the same. Compared to oil painting, which can go yellow over time, you won’t have to worry about this problem. This paint is also flexible. It can be applied thick or thin — whatever you choose. These paints also leave no smells and are non-toxic, which is ideal for those who work in confined areas. Buying a set will often be much cheaper than buying individual tubes, and this is a great starting point for beginners who just want to start painting and don’t want to worry about the necessary supplies. If you need more in terms of quantity, it is best to buy it in gallons. With most big name craft stores, be sure to look for coupons or special promotions before making your purchase.